HUNTSVILLE — Call it cold comfort. 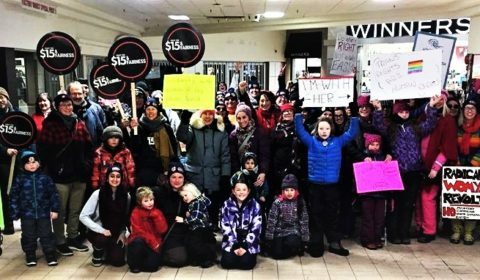 Cars honked and onlookers gave the thumbs up or shouted encouragement Saturday afternoon, as more than 125 women and men, boys and girls, young and older braved the start of a frigid weekend by parading downtown Huntsville in the Women’s March Muskoka. The women-led initiative from the Huntsville Place Mall to and back from the River Mill Park aimed to bring the entire community together, regardless of gender identity, in solidarity of women’s issues. It was part of an international movement called Women’s March Global. The local walk will depart from Huntsville Place Mall and stroll down to River Mill Park, where it will turn around and return to the mall. “We firmly believe that change happens when we bring the entire community to bear on these issues and challenges. This is an opportunity for unity, solidarity, and community building,” said a pre-walk news release. “Over 80 per cent of women in Muskoka, who have experienced physical abuse, never report that crime to the police,” the release said. Participants gathered inside the Huntsville Place Mall to suit up for the walk downtown.